Good brief, that *is* a lot of airports to choose from. Whilst I hope that MH370 *is* maybe located at one of them there is another important issue; Most Airports/Countries indicated have cellphone coverage, and it is extremely likely that some of the passengers would have either left their phones on accidentally during the flight – or tried (if able) to use their phone/s wherever the plane was low enough and/or close enough to any Cellular Base Station/s (?). This would thence reveal the locations and/or trajectory via signals received from the passengers’ phones…..
Do they all have airstrips that can support a 777 landing? No. But that is the whole point. If you find an airport listed as closed or small, but it clearly isn’t any longer in the satellite image, then that might be a clue. Known large airports have a major problem — they are known. Building an airport for a 777 from scratch is a huge undertaking, but enlarging a small airport — not so much. Qiemo airport in northwestern china is spot on the Ping-circle. Uighur terrorist kept secret by China? By what logic would China want to keep that (and all the passengers) secret? China usually don’t like attention of their minority groups causes. Plane hijackings are usually performed to gain attention. Thats was the case with all the hijackings by palestinians. They held the plane on the ground. Sometimes for days, with demands. If the plane has landed it would be known to that countrys gouvernment. 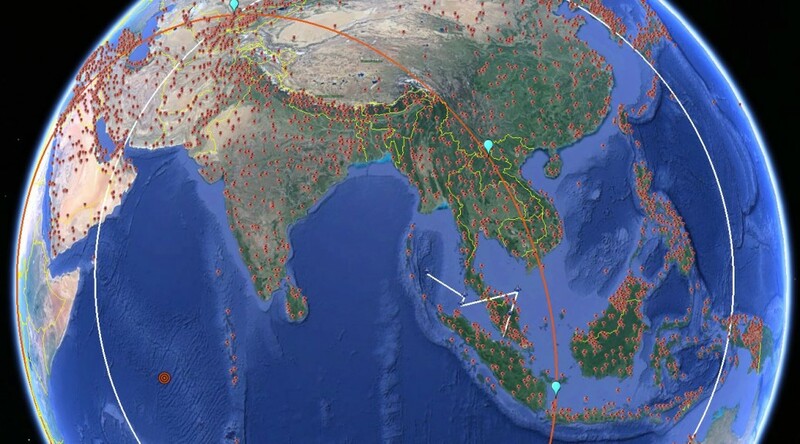 I heard that the last known trajectory for the plane was suspiciously on target with flight lane B466 (to Sri Lanka from Malaysia). Here’s the logic: acknowledging that the pilot could have ditched it in the drink at any given time, and under the assumption that the pilot had some place to actually go, if there was 6-7 hours worth of gas, and they used roughly 1 hour’s worth up until their last transmission (12:40-1:30am). If they did make the turn back across Malaysia for the next signal interception (2:40am), then that is 2 hours. They would have about 4-5 hours worth of gas, maximum, which would put them just west of India (over Arabian sea). So if they turned, odds are good that they would choose Myanmar, Bangladesh or Pakistan, but probably not enough gas to get to Oman. (omitting India because of its heavy airspace traffic and would have been spotted immediately). So, the question for me would be: how many known airports are there around that path that have runways long enough to stop a 777. (understanding that they could have changed trajectory at any point in that time, but if they thought they were no longer being tracked, they probably wouldn’t make many more false turns than one after getting into the B466 lane). Can we narrow down the list of airports, maybe? Actuallly… The transponder has four digits that can be “adjusted” – typically the codes are issued by clearance. Newer transponders transmit that information as well as other pertinent information including a serial number that may serve to identify the aircraft. The ability to see that data is dependent on both the transponder and the quip meant used to interrogate same. Stefan, I have onece again requested Inmarsat to release the full ping dataset for MH370 into the public domain for analysis. Does anyone have an idea why they have not released it?